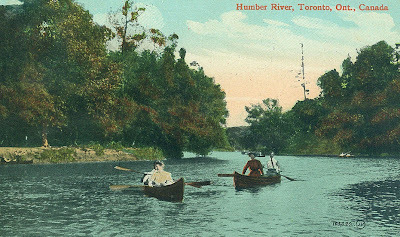 The Humber River from an old postcard. In 1972 I took up rowing when I joined the Argonaut Rowing Club of Toronto. At first, I rowed in four- and eight-man crews but I soon learned to scull so that I could row in a single. Normally the Argonaut crews rowed inside the breakwall that runs from Ontario Place to the mouth of the Humber River. Occasionally we took our shells up the Humber as far as the bridges at Bloor Street. The river's sheltered waters are ideal for rowing shells with their low freeboards. Whenever I sculled alone in a skiff the lower Humber became my favourite outing. So seldom did I see other boats, or even see a person on its banks, that I came to regard that stretch of the river as my own. In the summer when the rushes and reeds in the marshes are at their tallest and the trees have leafed out the city disappears behind a green curtain. It is easy to image yourself on a secluded country stream far from the city. Marshes and steep bluffs prevent direct access to most of the lower Humber. Over the years, as I raced up and down the river, I experienced a corner of Toronto's urban wilderness that few of its residents even knew existed. Above Bloor Street navigation of the Humber is restricted by a series of rapids and weirs. Three hundred years ago the end of navigable water also marked the start of the Carrying Place portage linking Lake Ontario and Georgian Bay via Lake Simcoe. When I first became acquainted with the Humber I had no idea about the river's historic associations. Later I learned that the lower Humber had seen the passage of Iroquois war parties heading for Huronia, and that French explorers Brule, Joliet, Hennepin and La Salle had very likely used the route. In the 1750s, near the end of the French regime, a trading post was for a short time located on the east bank near the Humber mouth. Later the same site became the home of one of Toronto's first European settlers. On the east bank a little way to the north of Bloor Street in the neighbourhood now known as Baby Point stood the Seneca village of Teiaigon. It would have been an almost idyllic place with ready access to the river and Lake Ontario a few minutes away. Between Lake Ontario and Bloor Street the river is divided into five relatively straight sections, varying in length from 300 to 450 metres for a total of about 2 kilometres. Comparing maps from the 1700s and 1800s with modern ones demonstrates that the lower Humber has not altered its course significantly since that time. When I first started with the rowing club we used to row on the river in fours and eights but the bends were difficult to negotiate in the longer boats. On the other hand a single sculler could easily steer round the bends with little fuss. In the early 1980s the officials of the rowing club, after a series of accidents, decided that the fours and eights should stay out of the Humber. For the single scullers the river became even more isolated and uncrowded. Occasionally a power boat would appear on the Humber. There is even a power boat yacht club on the river near Bloor Street. The members of the Humber Yacht Club were generally considerate with their wakes when passing a shell careful not to swamp it. However, there were other power boaters who insisted on roaring up the river causing disruptive wakes. Once, as I rounded a bend on the river I was surprised to see a power boat racing toward me. As the boat rounded the bend I looked up at the underside of the banking hull and hoped that it did not side slip and hit me. Fortunately, he had room enough as I had been hugging the shore. The driver did not see me until his boat had leveled out on the straightaway and he happened to look back. It is not likely that he heard my comments over the roar of his engine. From time to time a police boat would make its way up the Humber. One afternoon I was returning downstream when one of the aluminum riggers of my skiff cracked. I managed to stay upright and maneuvered the boat to shore without capsizing. There was no way of rowing the boat with the cracked rigger without causing more damage. Earlier I had seen a police launch go up river so I waited for it to return. When the launch came round the bend I asked the two constables if they could call the rowing club to send a motor boat to pick me up. The officers offered to load the skiff aboard their launch. I readily accepted and rode back to the club in style. The police launch was one of the old wooden hull patrol boats from the 1920s that I had admired for years. Curiously, prior to the mid-1980s I rarely saw canoes and kayaks on the Humber even though the Humber Marshes are ideal for exploring in such craft. Canoeists simply did not consider it worth their while to spend time on a river running through a major urban area. I have to attribute this lack of interest in the Humber to the generally poor reputation the Great Lakes and their associated waters had after the 1960s. Great Lakes pollution levels seemed to peak in the early-1970s. Sometimes the pollution was very evident in the form of garbage floating in midstream or thrown up on the banks. At other times it could be a slick of oil floating on the surface. In the aftermath of heavy rains the amount of debris on the Humber was revolting. The ubiquitous shopping carts always puzzled me. Why would anyone push one down to the water only to toss it into the river? While I can only give an opinion based on my observations and impressions, the water quality on the Humber did seem to improve between 1972 and the late 1990s. It took a long time for the general public to realise it. Meanwhile, the quantity of wildlife that I saw, including birds, fish and mammals, seemed also to increase over that period. Rowing shells are unotrusive, making little noise and are excellent platforms for observing wildlife. The drawback is that you approach everything going backwards. The bird life on the Humber could be spectacular at times. The birds one normally saw included night herons, great blue herons, red-wing blackbirds, mute swans, Canada geese, mallard ducks and crows. I once saw a pheasant on one of the low wooded banks. Prior to the early 1980s the cormorant was a bird that I never saw but gradually they became more common. Their presence would seem to indicate that the population of forage fish was increasing. Of course there were often seagulls on the river. Great black backed gulls were sometimes seen feeding on a dead salmon or carp. Throughout the summer a small group of Caspian terns would sit on the section of the breakwall just at the mouth of the Humber. The night herons sitting on low branches that hung low over the water could sometimes be counted in the dozens. On the east bank of the third bend there is a steep sand bluff from which a number of trees used to cling to. I recall rowing past one day and seeing that some of the trees had fallen into the river. 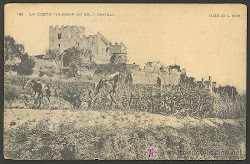 When the tree roots had pulled out of the bluff they left holes. Within a few days the holes had been occupied by nesting barn swallows. Their nests were inaccessible to even the most determined raccoon. All that summer the river valley was alive with swallows swooping and diving. All along the Toronto waterfront a tremendous increase in the Canada geese population occurred during the 1970s and every spring the Humber would be packed with goslings and their parents. In the 1990s I noticed that the numbers of geese declined. I can only attribute the decline to the appearance of a pair of nesting mute swans. Despite their stately appearance, I am ambivalent about these very territorial birds. Mute swans are non-native but also very aggressive towards other water fowl, hence the decrease in geese. The pair usually built their nest in the marshes along the second straightaway. Several times I was subjected to feint attacks by the males. The swan would fly toward me along the length of a straightaway as I rowed along. With my hands occupied with the sculls, all I could do was watch helplessly as the huge bird rushed toward me. I had no idea what it was going to do but as it got to within 20 meters of the stern of the skiff the swan settled on the water while slapping its feet on the water, its neck outstrectced and threatening. The bird continued to approach until it lunged with its bill at the stern of the skiff. The bird is very powerful and can, at least, inflict a painful bite. Presumably, the swans viewed scullers with their oars sweeping back and forth as some sort of giant waterfowl that had to be challenged. The mammals present along the river were more wary of humans than the birds. It was common to see beaver, muskrat, raccoons and the odd fox. I started observing beaver in the late 70s. I would some times see them swimming across the river astern of my shell or waddling along the shore. The beavers often left evidence of their presence on the trees that they were cutting. Raccoons were fairly common but they presumably had an easier time scavenging amongst the houses that back on to the Humber ravine. Foxes are of course much rarer, at least warier, but they were sometimes visible at the water's edge. From a rowing shell the fish life is harder to appreciate. The water of the river is typically a chocolate-milk brown and it is difficult to see fish. Sometimes as one sculled along watching the shell's wake and the pairs of swirls made by the oars a third swirl would mysteriously appear. It would be the result of some fish approaching the hull and suddenly turning away and stirring the water. In the spring rainbow trout make their runs upstream from Lake Ontario. In the fall Chinook and coho salmon, both non-native and stocked in the lake, make their runs up the Humber. The Humber has some very large carp, some weighing up to 30 pounds, and they spawn in the marshes. 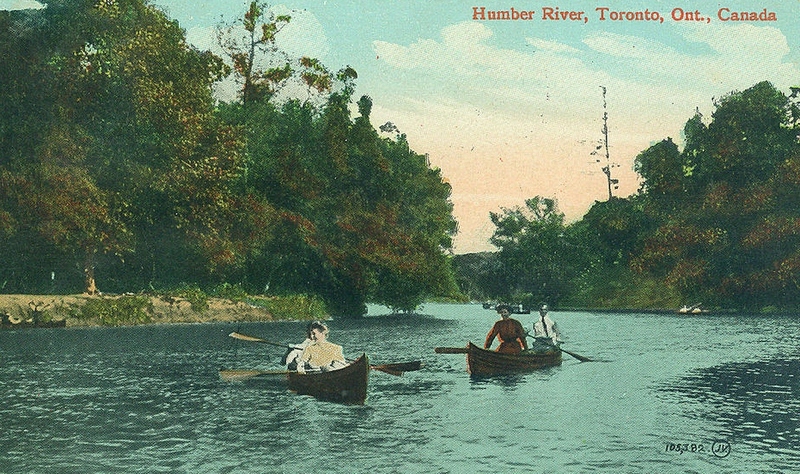 The reason the scullers were on the Humber River was to train for races. And, it is a great place to train. The layout of the river allowed for various types of workouts. Sometimes I would row steady state pieces keeping at a constant rate and pressure, make a quick turn at the top of the river and head back to the mouth. Depending on how many trips you made you could easily build up the mileage. Sometimes I put in all-out sprints on the straightaways and then eased off going round the turns. The calm waters made it an ideal place to work on improving sculling technique. On the second straightway, which is more than 450 metres long and wide enough, two scullers could race side by side. Occasionally on Saturday mornings 15 or 20 Argonaut scullers would meet up just below the Bloor Street bridges and race all the way back to the rowing club. It was a seven-kilometre long workout and it called for good judgement and skill to negogiate the river bends while racing. On those days the procession of scullers would pass for what would be considered heavy traffic on the Humber. Then there was always the problem of water conditions at the Humber mouth. It could get pretty rough for a rowing shell where the river current meets the swell from the lake. Until you had reached the protection of the breakwall you could expect to get wet and bounced about. It has been so long since I last sculled on the lower Humber that I can no longer think of it as my preserve but other scullers have now made it their own. In addition to the Argonauts a number of other scullers now keep their shells at the Humber Yacht Club. It is an appropriate development as the quiet waters of the river are more suitable for sculling than for power boats. Perhaps a new Toronto rowing club will emerge from this association. From what I have heard and read the Humber's water quality continues to improve. I recently read that Atlantic salmon, which had been extirpated in the 1880s from Lake Ontario, had in 2011 been reintroduced into the Humber. It is long overdue but perhaps it had to wait until water quality had improved sufficiently. Toronto is fortunate that it has such a river running through it.